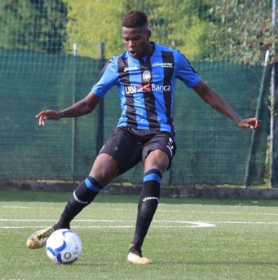 Promising Nigerian defender Caleb Okoli has been handed another opportunity to make his professional debut after he was named in the provisional roster by Atalanta manager Gian Piero Gasperini for their Coppa Italia clash against Cagliari on Monday evening. Twenty two players were included in the traveling party for tomorrow's match at Sardegna Arena, meaning Okoli is certain to be named in the match day squad as the Italian Federation permits up to 12 players to be on the bench. If he steps out onto the pitch, he would be wearing the number fifty five jersey. Okoli is a physical central defender blessed with excellent aerial prowess and anticipation. Born in Vicenza seventeen years ago, he is touted to be one of the best young defenders in the Primavera 1 and has 11 starts to his name for Atalanta U19s in the league this season. He was an unused substitute as champions Juventus were held to a 2-2 draw by Atalanta in the Serie A on December 26, 2018.